In 2012 the Australian National Museum led a project called Urban Farming and the Agricultural Show which explored how agricultural shows, helped to shape understandings of the relationships between food, people and place. At the same time (2013) they released Food Stories, a program of digital content creation and publication which allowed audiences to share their food stories. Both initiatives represented a relatively traditional approach to the interpretation of food production and culinary heritage. The introduction of 3D food printing brings another dimension to the curatorial and outreach endeavour. A 3D food printer is a special 3D printing system which enables the construction of parts using edible materials mainly from viscous materials (e.g. cheese, paté, dough, chocolate) and powdered substances (e.g. sugar). In this paper we explore how a museum can be used as a laboratory for engaging audiences in new food production and resultant interpretations of culinary heritage. A traditional cuisine is a rich source of creativity, as evidenced through the recent 3D food printing projects. See ChefJet, Foodini, Bocusini, Pancake Bot, Barilla's 3D pasta printer at EXPO 2015 and many other initiatives. However, 3D food printing in a museum context has yet to be explored. Additionally, the potential of 3D food printing for the creative reinterpretation of culinary heritage is discussed in a context of burgeoning makerspaces, many of which are located in community spaces and equipped with rudimentary digital fabrication facilities. We underpin our paper by considering the opportunities afforded museums to act as creative laboratories, providing makerspaces which engage audiences in digital fabrication with access to significantly more expensive highly specialised equipment such as 3D food printers. This premise is supported by cases from NEW INC, the New Museum (NY) museum-led incubator which demonstrate the potential for museums to act as laboratories. The preparation and consumption of local and global foods has never been more topical than it is today. Food security and nutrition issues explored at a global level (EXPO 2015: Feeding the Planet, Energy for Life), while the skills and practices associated with domestic food preparation are the subject of multiple reality TV-programs. Popular locally produced programs such as My Kitchen Rules and Master Chef (Bodey, 2015) are part of global franchises while, in the UK, The Great British Bake-off 2014 grand final drew more audience numbers (12.3 million) than the World Cup final (12.1 million) (Malnick, 2014). At the same time, new museums specifically dedicated to food and communities, but not affiliated with food industry, such as MOFAD (Museum of Food and Drink), are also arising (Merritt, 2015). In 2012 the Australian National Museum led a project entitled “Urban Farming and the Agricultural Show” which explored how agricultural shows helped to shape understandings of the relationships between food, people and place. In the following year (2013) they released “Food Stories”, a program of digital content creation and publication, which allowed audiences to share their food stories. In terms of re-use of heritage and creative participation of audiences, both initiatives represent a relatively traditional approach to the interpretation of food production and culinary heritage. In this paper we explore opportunities for museums to become creative labs pursuing creative reinterpretations of cultural content through the use of new digital fabrication technologies. 3D food printing is one of those technologies. 3D food printing (Cohen et al., 2009), first introduced in 2006 (Lipson & Kurman, 2013) is bringing another dimension to the curatorial endeavor. A 3D food printer is a special 3D printing system which enables the construction of parts using edible materials mainly from viscous materials (e.g. cheese, paté, dough, chocolate) and powdered substances (e.g. sugar). In this research we explore how a museum can be used as a laboratory for engaging audiences in new food production and resultant reinterpretations of culinary heritage. A traditional cuisine is a rich source of creativity, as evidenced through the recent 3D food printing projects. See Foodini (Molitch-Hou, 2015), ChefJet (Ngo, 2015), Bocusini (Biggs, 2015), Pancake Bot (Senese, 2015), Barilla’s 3D pasta printer at EXPO 2015 (Alec, 2015), Australian project EdiPulse (Khot et al., 2015) and many other initiatives. However, the potential of 3D food printing for the creative reinterpretation of culinary heritage in a context of a makerspace (Dougherty, 2013) in a museum at which visitors can be creatively engaged, has yet to be explored. Many burgeoning makerspaces, equipped with rudimentary digital fabrication facilities, are located in community spaces and science/cultural centers. Due to their rich resources, makerspaces are also entering into museums. In New York, NEW INC, the first museum-led incubator, demonstrates the potential for museums to act as creative laboratories. This innovative platform was established by the New Museum in 2013 to support creative professionals not only with their lab-like co-working space, but also with resources from the New Museum’s collection of contemporary art. Additionally, a few examples of 3D food printing in museums have already been introduced. For instance, in Sydney by Vivid Ideas 2013 and through the Eat the Collection project at the Powerhouse Museum (Museum of Applied arts and Sciences) collaborated with ten creative industry professionals on re-use of some of the museum objects (Kinski, 2013). During the public event, their reinterpretations were 3D printed in chocolate and visitors were invited to eat them. Throughout 2015 we conducted a research project exploring how digital technologies can aid younger generations of Slovenian Australians to preserve and communicate Slovenian culinary heritage in Australia. The central aim of the research was to explore how their creative participation in culinary heritage could enhance notions of identity as Slovenian Australians. Culinary heritage has long been connected with notions of identity and together they form an important part of intangible heritage and a universal way of bringing people together. Throughout the course of the research, 18 in-depth interviews were conducted among members (all generations and ages) of Slovenian ethnic groups in Australian cities. It was discovered that, for many of them, traditional Slovenian cuisine is still an important part of their lives. Since most traditional Slovenian dishes (especially desserts) require a great deal of preparation time, together with advanced cooking skills and knowledge, they are usually prepared by members of the older generations (mothers, grandmothers) for family gatherings during holidays or other special events. Therefore, it was decided that a Slovenian dessert would be chosen as a test case for creative reinterpretation through 3D printing. Potica is one of the most typical Slovenian festive cakes. Among gibanica and štruklji, it is one of the most popular desserts also by Slovenian migrants in Australia. 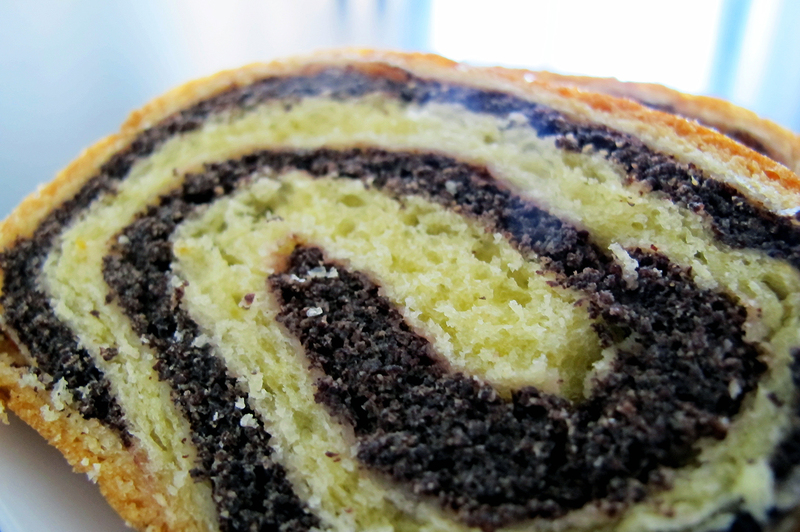 Potica (Figure 1) is made from a bread dough and filling such as walnut, tarragon, poppy seed and cottage cheese. It forms a large hollow cylinder and when cut, every slice has a nut-roll style shape. Figure 1: Slices of a poppy seed potica made by Jožica Koštrica, a Slovenian-Australian cooking expert from Canberra (Photo: Kaja Antlej). 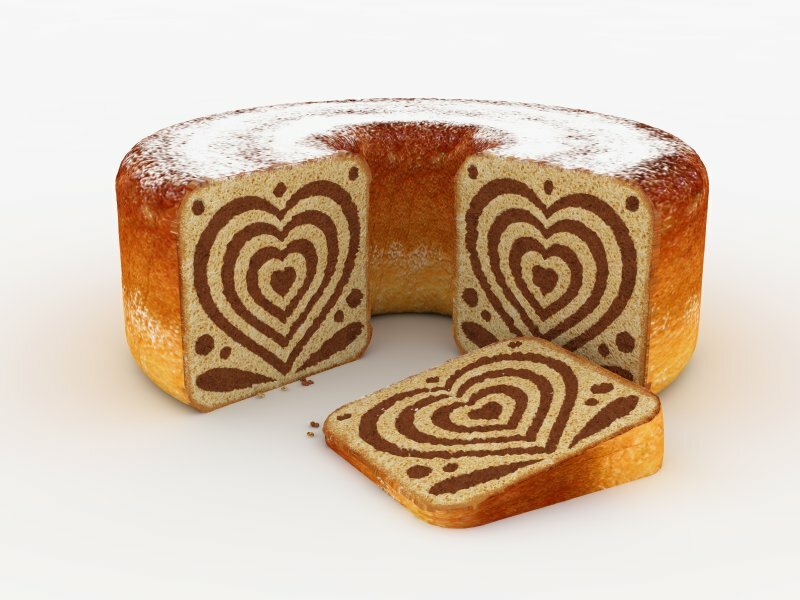 The characteristic potica has a central spiral, but through 3D food printing, potica can be created in a multitude of different shapes and can incorporate forms inspired by other Slovenian motifs (Razboršek, 1992) such as hearts, plants and flowers. Using potica as a test case, we explored the notion that museum visitors could creatively engage in the reinterpretation of the dessert by accessing digital fabrication technologies through museum makerspaces. The research hypothesized that participants in a museum (e.g. Immigration Museum) could use a special app to design their own image of a potica slice. The newly created image could be generated into a 3D model (Figure 2) and prepared for 3D printing. Since a two material (two syringes) 3D printer is needed, we propose to use Scientist 3D printer or a similar machine from Seraph Robotics, together with their software for generating multi-material print jobs from a single standard STL file. This 3D printer also represents a further development of a Fab@Home model 2, which was successfully used for 3D printing a prism-shaped cookie with a chocolate letter “C” in the interior (Lipton, et al., 2010). Figure 2: Visualization of a 3D printed potica cake (concept) (3D model: Kaja Antlej; texturization and rendering: Nina Oman). The conceptual framework for creative reinterpretation of culinary heritage is one which requires further investigation. While conceptually, a 3D model of potica can be created and print files produced, there is much testing of dough and filling which would need to be carried out. The opportunity to use museum collection knowledge to aid this experimentation offers a unique opportunity to bring together collections, culinary heritage and digital fabrication in a new space of investigation and innovation. We contend that museum visitor engagement in the process of experimentation would go some way towards modelling how museum makerspaces can enact the notion of a creative laboratory. However, we underpin our work by considering the opportunities afforded museums to act as creative laboratories, providing makerspaces which engage audiences in digital fabrication with access to significantly more expensive highly specialized equipment such as 3D food printers. The research has been made possible through the support of an Australian government 2015 Endeavour Research Fellowship (Postdoctoral Research) of Kaja Antlej at the Centre for Creative and Cultural Research, Faculty of Arts and Design, University of Canberra under supervision of Professor Angelina Russo and provided by the Australian Government Department of Education. Antlej, K., M. Kos & J. Horvat (2013). “3D-tehnologije kot podpora muzejski razstavi industrijskega oblikovanja (3D Technologies as a Support for Industrial Design Museum Exhibition).” Doctoral thesis, University of Ljubljana. Antlej, K., & S. J. Mächtig (2008). “Razvoj industrijsko oblikovanega izdelka z uporabo 3D tehnologij (The Development of an Industrially Designed Product through the Use of 3D Technologies).” Masters thesis, University of Ljubljana. Dougherty, D. (2013). “The Maker Mindset.” In M. Honey & D. E. Kanter (ed.). Design, Make, Play: Growing the Next Generation of STEM Innovators. New York: Routledge, 7–11. Lipson, H. & M. Kurman (2013). Fabricated: The New World of 3D Printing. Indianapolis: John Wiley & Sons, 134. Merritt, E. (2015). “Beyond the Walls: A conversation with Peter Kim about creating a museum of food and community”, Museum, May/June, 2015, 43–49. Razboršek, I. (1992). Slovenska krasilna umetnost. Celje: Mohorjeva družba.
. "Museums as creative labs: 3D food printing inspired by culinary heritage in the context of makerspaces." MWA2015: Museums and the Web Asia 2015. Published August 14, 2015. Consulted .